�New urbanism has been a buzzword since the late 1990s, meaning homes are closer to the street and closer together, with sidewalks to promote community closeness,� says Keller Williams Realtor T.J. Trimeloni. A five-mile trail beckons neighbors to enjoy a brisk walk past brightly colored homes, sparkling lakes and ponds. All homes have fiber cement siding that resembles wood siding and comes with a 50-year guarantee. One- and two-car garages are optional. The detached garages are placed toward the rear of the lots and are accessible through an alleyway. �Trash and recycle bins are located in the service alley, too. This keeps the front part of the home clean and uncluttered,� says Trimeloni, an agent specializing in the Summerville and Greater Charleston areas. Other options include sunrooms, gourmet kitchens and additional bedrooms. Buyers can also choose from a number of pre-owned homes. White Gables features a community clubhouse, large pool, children�s pool, basketball court, tennis court, large playground and two common areas. 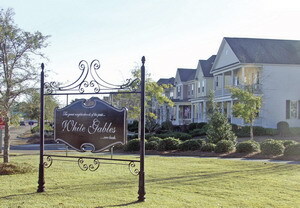 White Gables is a diverse community, �great for just about any lifestyle,� says Trimeloni.